Earlier you have download Grammarly for proofreading CYBER EXPO Typing jobs projects. 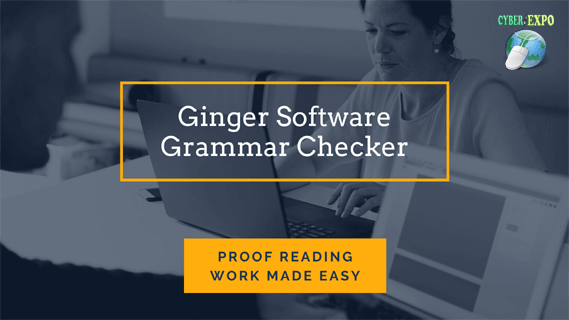 To take proofreading work to the next level, we want all our member use Ginger Software. After checking your work with Grammarly Ginger Software help cross-check your work. If there any spelling mistakes or grammatical error escape while you checked with Grammarly Ginger Software cache them all and help you proofread your work 100%. If you are working in a Data entry projects with CYBER EXPO, it’s strongly recommended that you use Ginger Software to make your typing projects grammatical error free. Also, if any Data Entry Jobs member starts doing work without this Software, then the account will be terminated. How does Ginger Software work? This Software is the award-winning grammar and spells checker that corrects all types of English grammar and spelling mistakes. It helps you to fix any type of grammatical error from your content. For doing Typing Jobs, even an expert will make mistakes and ruin entire projects. Sometimes its very hard to fix the error of misplacing full stop, Comma, Semicolon, etc. Ginger Software do this all for you in free, with a click. How to use Ginger Software with Microsoft office work? Once you visit the Ginger Software website, you have to download Ginger for windows. If you want you can download Ginger from Chrome for checking your online typing. Now you can able to see there is new Ginger Software tab added to your MS word menu. Once you did with your typing, you can check all the spelling and grammatical and make them correct with few clicks. Here is Video Tutorial that let you know how to install Ginger Software step by step. After installing Ginger Software and Grammarly, you should start proofreading your work.